At a NASA briefing this afternoon, Alan Stern, New Horizon’s principal investigator, answered questions from the media and the public on today’s historic flyby, discussing the team’s latest impressions of Pluto’s surface, how the data is being transmitted back to Earth, and much, much more! Here are all the key answers we got. How fast is New Horizons sending data back to Earth? That depends: The science team has a term called ‘rate stepping’ to describe the speed at which we receive data based on the position of the New Horizons spacecraft in Earth’s sky and the inclination of our ground antennae. Currently, our antennae are receiving data at their lowest rate, roughly 1,000 bits per second. We can achieve download rates of up to 4,000 bits per second when the spacecraft transitions to ‘spin mode’—literally pointing itself at the Earth and spinning along its axis for increased stability. Basically, our ability to download new images of Pluto makes dial-up internet look downright zippy. This is why it’ll take us an estimated 16 months to download all the data New Horizons sends home this week. It looks like the surface of Charon is more cratered than that of Pluto, yes? We’ve known for some time now that the surface of Pluto and its largest moon Charon are different. To Stern’s eye, the images we’ve received so far show a much younger surface on Pluto and an older, more battered surface on Charon. What’s the maximum image resolution we hope to get on the dark side of Pluto? That’s a tough question, NASA says. For those who aren’t aware, now that the New Horizons spacecraft is beyond Pluto, it’s looking back at the planet and seeing the night side. This would be a bit of a bummer, except that the science team cleverly arranged the flyby to occur on a day where Charon is on the opposite side (the daylight side). Sunlight is bouncing off Charon, illuminating those otherwise obscure nightside terrains. While Charon’s reflected light allows us to see terrains that would be invisible, we’re looking into the glare of the sun, which mean’s we’re picking up a lot of noise. To boost the signal to noise ratio, we need to combine pixels on our images. Essentially, we’re making a dark, grainy image of Pluto’s nightside somewhat less grainy, but losing resolution in the process. The heart shaped feature on Pluto’s surface appears slightly different on the right and the left side. Is this a visual trick, or could it be indicative of a real difference? NASA scientists are seeing the same thing we are: A bit of a left-right dichotomy on the heart. According to Stern, ‘we’ll know more when we get color data.’ Hrmph. When will we see the latest color data on Pluto? We have color data on ground right now, and the science team is working on processing it. We may see some more color images later in the day. 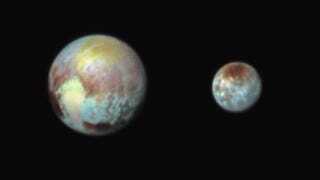 The image shown at the top is a composite of Pluto (left) and Charon (right) presented at the recent media briefing and published by New Scientist. (More on that image over at space.io9.com). Note that the colors in this image have been exaggerated to highlight different surface features on each of the worlds. What will our scientists see on the monitors tonight when New Horizons phones home? When NASA establishes a ‘handshake’ between the ground station and the spacecraft, the first thing the science team will try to lock down is the carrier signal: That tells us the spacecraft is actually there. Next up, we’ll look at the telemetry data to see whether New Horizons is transmitting signal at the expected rate. All of this information will be encoded as a string of ones and zeros, but the science team’s ground database has mapped this binary code to symbols that say ‘out of lock’ or ‘lock’— and that’s what our science team will see on the ground. Then, we’ll start getting real-time data on all the subsystems on board the spacecraft. New Horizons sends telemetry data by cycling through the craft’s subsystems—things like the main computer status and main controls. When we intercept the signal, we don’t know where in the subsystem rotation we’ll catch it, but the science team believes we’ll have enough time to cycle through each of the subsystems and ensure the entire spacecraft is functioning properly. If we don’t hear from New Horizons tonight....how much of its data do we already have? First off, NASA thinks the probability of losing the spacecraft is extremely low: about 2 in 10,000. As Stern points out, this means you could fly hundreds of New Horizons spacecrafts through the Pluto system and expect each of them to survive. Nevertheless, NASA has been furiously transmitting initial data to the ground, which Stern calls the ‘failsafe datasets’. Basically, we’re trying to download as much as we can now, so that we’re as prepared as possible should a tiny meteoric impact put New Horizons out of action early. So far, Stern says, the failsafe dataset consists of compositional data, color data, and spectroscopic data about Pluto’s atmosphere. But 99 percent of the data is still on the craft, along with most of the really important stuff. Will we return to Pluto after New Horizons? Can I watch New Horizons phone home this evening? Yes! If you go to eyes.nasa.gov, you’ll be able to see—almost live—when our phone home signal arrives tonight at 8:30 PM ET. We’ll also be livestreaming the event over at space.io9.com.